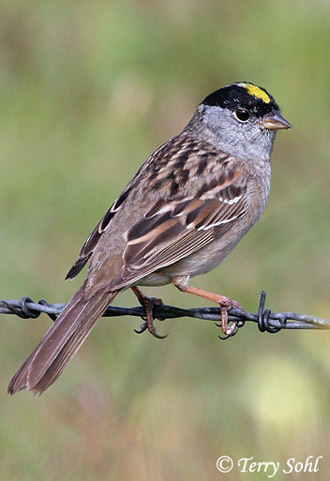 The Golden-crowned Sparrow is a bird of the extreme western portion of North America, breeding in western Canada and Alaska and wintering near the U.S. West Coast. The "Birds of South Dakota" (SDOU -- 2002) only lists two identified occurrences of the species in South Dakota, as the we are quite far from its normal range. Habitat: Breeds in shrubby habitats ranging from willow thickets, stunted spruce along the treeline, and high-elevation shrublands in the mountains of western Canada and Alaska. Also prefers brushy habitat in winter and in migration. Diet: Primarily seeds and insects, but will also feed on berries and fruits, new buds and shoots, and flowers. Breeding: Gregarious in most seasons, feeding in small flocks, often mixed with other sparrow species. Typically forages on the ground, usually in and around thick vegetation, although they will also forage in brush and up in trees. 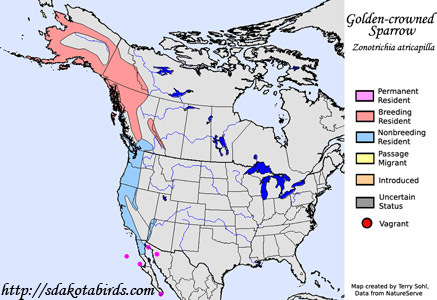 Song: A plain descending whistle..."Oh-dear-me"
Migration: Summers in Alaska and near the Pacific Coast in Canada. Winters along most of the U.S. and Canada Pacific Coast. Bird Feeders: Will attend feeders for a variety of different seeds. Conservation Status: Numbers appear to be stable. Photo Information: April 19th,2007 - Point Reyes National Seashore in California - Terry Sohl. Additional Photos: Click on the image chips or text links below for additional, higher-resolution Golden-crowned Sparrow photos. South Dakota Status: Extremely rare visitor in the state, with only a handful of records.